Ultraviolet radiation (UVR) is a very prominent environmental toxic agent. UVR has been implicated in the initiation and progression of photocarcinogenesis. UVR exposure elicits numerous cellular and molecular events which include the generation of inflammatory mediators, DNA damage, epigenetic modifications, and oxidative damages mediated activation of signaling pathways. UVR-initiated signal transduction pathways are believed to be responsible for tumor promotion effects. UVR-induced carcinogenic mechanism has been well studied using various animal and cellular models. Human skin-derived dermal fibroblasts, epidermal keratinocytes, and melanocytes served as excellent cellular model systems for the understanding of UVR-mediated carcinogenic events. Apart from this, scientists developed reconstituted three-dimensional normal human skin equivalent models for the study of UVR signaling pathways. Moreover, hairless mice such as SKH-1, devoid of Hr gene, served as a valuable model for experimental carcinogenesis. Scientists have also used transgenic mice and dorsal portion shaved Swiss albino mice for UVR carcinogenesis studies. In this review, we have discussed the current progress in the study on ultraviolet B (UVB)-mediated carcinogenesis and outlined appropriate experimental models for both ultraviolet A- and UVB-mediated carcinogenesis. Radiation is classified as nonionizing radiation (NIR) and ionizing radiation (IR). IRs possess shorter wavelengths with higher frequencies and higher energy, whereas NIRs encompass long wavelength (>100 nm) with low photon energy (<12.4 eV). Except for the narrow visible region, NIR cannot be perceived by any of the human senses unless its intensity is so great that it is felt as heat. The NIR spectrum is divided into two main regions, optical radiations and electromagnetic fields. The optical radiations can be further subdivided into ultraviolet (UV), visible, and infrared radiations. The electromagnetic fields are further divided into radiofrequency (microwave, very high frequency and low frequency radio wave). UV radiation (UVR) is classified into near, medium, and far UV according to energy, where near and medium UV is technically nonionizing, but where all UV wavelengths can cause photochemical reactions that to some extent mimic ionization (including DNA damage and carcinogenesis). UVR above 10 eV (wavelength shorter than 125 nm) is considered ionizing. However, the rest of the UV spectrum from 3.1 eV (400 nm) to 10 eV, although technically nonionizing, can produce photochemical reactions that are damaging to molecules by means other than simple heat. Since these reactions are often very similar to those caused by IR, often the entire UV spectrum is considered to be equivalent to ionization radiation in its interaction with many systems (including biological systems). UV rays have more energy than visible light but not as much as X-rays. The main source of UVR is the sun although it can also come from man-made sources such as tanning beds and welding torches. UVR is considered to be important due to their impact on living organisms. Particularly, exposure to UVR causes severe health effects in human beings that include skin diseases, immunosuppression, photoaging, cataract, and skin cancer. This review mainly explains the mechanisms of UVR-induced carcinogenesis and experimental models employed in the study of UV-related cellular and molecular changes. Based on the wavelength, UVR is categorized into three types such as ultraviolet C (UVC; 200–280 nm), ultraviolet B (UVB; 280–320 nm), and ultraviolet A (UVA; 320–400 nm). The UVC spectrum is highly mutagenic but does not reach the earth's surface because it is completely absorbed by the stratospheric ozone layer. Conversely, UVA and UVB wavelengths represent 95% and 5% of the UV spectrum reaching the earth's surface, respectively, with UVA penetrating the atmospheric and stratospheric ozone, while UVB radiation is predominantly absorbed by these layers. UVB is considerably 20-fold less abundant than UVA; its energy is more efficiently absorbed by cellular molecules leading to damages within cells and tissues at significantly lower doses than UVA. Since nucleic acids are one among the primary chromophores, UVB causes direct DNA damage resulting in the formation of bulky damages between adjacent pyrimidine sites. UVB can also generate reactive oxygen species (ROS), but mechanism of their generation is different from that of UVA irradiation. UVA is generally considered to be less carcinogenic than UVB. 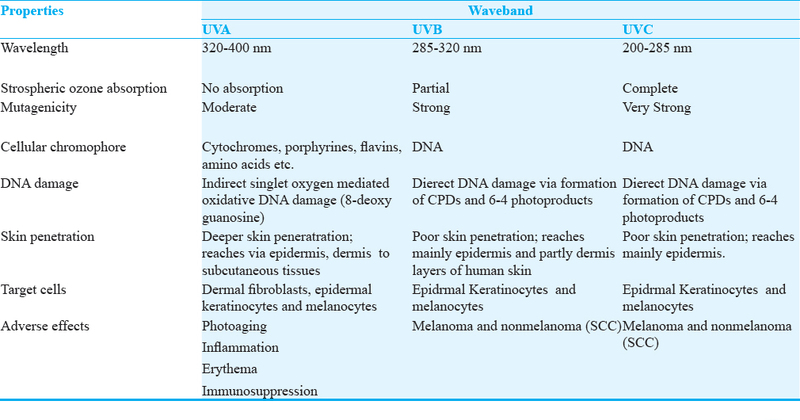 Low-energy UVA radiation is weakly absorbed by DNA but can be absorbed by other cellular chromophores and induces mainly oxidative changes through generating of ROS leading indirectly contribute to the DNA damage [Table 1]. Absorption of UV rays by DNA generates the formation of mutagenic cyclobutane pyrimidine dimers (CPDs) and pyrimidine (6-4) pyrimidone photoproducts (6-4PP) [Figure 1]. These damages are the major cause of skin cancer because, in turn, they can lead to signature UV mutations. A four-member ring structure involving C5 and C6 of both neighboring bases referred to as CPDs is formed in higher quantity by cycloaddition reaction between two pyrimidine bases in single-stranded DNA (ssDNA) and at the flexible ends of poly (dA)-(dT) tracts but not at their rigid center. Horikoshi et al. illustrated the crystal structure of the nucleosome containing UVB-induced CPDs. Cannistraro et al. have shown that CPDs of TCG sites deaminate and could contribute to the formation of UV mutation hotspots. Song et al. showed rotational position and flanking sequence in a nucleosome which modulate CPD formation and subsequent deamination contribute to C to T mutations which are associated with skin cancer induction. The 6-4PPs are formed by a noncyclic bond between C6 (of the 5′-end) and C4 (of the 3′-end) of the involved pyrimidines through spontaneous rearrangement of the oxetane (when the 3′-end is thymine) or azetidine (when the 3′-end is cytosine) intermediates. The 6-4PPs are converted into their Dewar valence isomers upon exposure to UVB radiation that may further undergo reversion to the 6-4PPs upon exposure to short-wavelength UVR. UVB-induced ROS as well as DNA lesions such as CPDs and 6-4PPs may cause primary as well as secondary breaks. These lesions are commonly associated with transcription/replication blockage that may lead to production of DNA double-strand breaks (DSBs) at the sites of collapsed replication forks of CPDs-containing DNA., The generation of DNA DSBs in UVR-irradiated cells, specifically in replicating DNA, has been known for a long time, and DNA strand breaks are observed extensively. It was assumed that initial PPs are converted into DSBs during DNA replication due to “collapse of replication forks.” Overall, it seems that UVR does not directly produce DSBs but rather produces pyrimidine dimers and other PPs leading to replication arrest and DSBs. It has been considered that UV-induced DNA lesions such as CPDs, 6-4PPs, abasic site, strand breaks, and oxidative product are the predominant and most persistent lesions and if not repaired may cause severe structural distortions in the DNA molecule, thereby affecting the important cellular processes such as DNA replication and transcription, compromising cellular viability and functional integrity, and ultimately leading to mutagenesis, tumorigenesis, and cell death. Indirect mechanisms of UVR-mediated DNA damage are observed at longer wavelengths (UVA, visible light), at which DNA absorbs only weakly or not at all. An increasing body of experimental evidence supports a causative role of UVA irradiation in photoaging and carcinogenesis of human skin by photooxidative mechanisms mediated ROS. The formation of ROS as mediators of photooxidative stress in UV-irradiated skin seems to be dependent on endogenous photosensitizers such as porphyrins, cytochromes, and flavins. The molecular consequences downstream of UVA-driven ROS production on skin structural integrity, signal transduction, gene expression, and ultimately tumorigenic initiation and progression are widely studied, but the upstream molecular mechanisms linking UV-photon absorption with ROS production in the skin have been elusive. According to the first law of photochemistry (Grotthus–Draper law), light must be absorbed by an atom or molecule to initiate a physical or chemical process. Photosensitization occurs when a photoexcited chromophore does not return to the electronic ground state by mechanisms of energy dissipation such as heat generation or photon emission but instead initiates chemical reactions leading to the formation of reactive intermediates and toxic PPs. Lifetime of the excited state of the chromophore is sufficiently long to allow interaction with target molecules. Therefore, it becomes apparent that the physical nature of the UVA photons and the chemical nature of the absorbing chromophore in the skin determine the ROS generation in the human skin. This UVA-induced ROS, in turn, acts as a powerful mutagen that may cause oxidative DNA damage. A number of oxidation products of purine bases such as 8-oxo-7,8-dihydroguanyl (8-oxoGua), 8-oxo-Ade, 2,6-diamino-4-hydroxy-5-formamidoguanine (FapyGua), FapyAde, and oxazolone have been reported to form upon exposure of DNA to UVA radiation. Most of the solar UV energy incident on the skin is largely from the UVA region compared to UVB content. The most important DNA damage repair system involved in excision of damages caused by UVR (such as CPDs and 6-4PPs) is the nucleotide excision repair (NER) mechanism [Figure 2]. Defective NER resulted in the development of squamous cell carcinoma (SCC). This system can act in two subpathways: faster transcription-coupled repair that operates on transcribed strand of active genes, and slower global genome repair (GG-NER), that removes lesions within the entire genome. Two-step recognition model for NER initiation demonstrated that XPC first binds to small ssDNA gap caused by disrupted base pairing. Although XPC is the main initiator of GG-NER, UVR-induced CPDs are a poor substrate for XPC, mainly because they only mildly destabilize the DNA helix. Hence, to enhance CPD repair, the UVR–DNA damage-binding protein (DDB) complex, which comprises DDB1 (also known as XPE-binding factor) and the GG-NER-specific protein DDB2, directly binds to UVR-induced lesions and functions as an auxiliary damage-recognition factor by stimulating the subsequent binding of XPC. XPC binding to the lesions will provide a substrate for the association of the transcription initiation factor IIH (TFIIH) complex, which is a transcription initiation. TFIIH was originally identified as an essential TF, but it can switch between functions in transcription and in NER. It has two helicase subunits, namely, XPB (encoded by ERCC3) and XPD (encoded by ERCC2), has opposite polarities and extends the open DNA configuration around the lesion, and verifies the presence of a lesion. The ATPase activity of XPB is mainly responsible for recruiting TFIIH to site of DNA damage, and the 5′–3′ unwinding activity of XPD seems to be indispensable for NER. Studies using in vitro experimental system clearly demonstrated that the XPD helicase is mainly required for damage verification. If the XPD helicase failed to detect any damage, the repair reaction may be aborted. Damage verification also probably involves the XPA protein, which detects nucleotides with altered chemical structures in ssDNA. After a lesion detection and verification, they must be excised, such this reaction is catalyzed by the structure-specific endonucleases XPF–ERCC1 and XPG (encoded by ERCC5), which incise the damaged strand at short distances 5′ and 3′ from the lesion. Coordination of incision involves the assembly of XPA, XPG, and replication protein A (RPA) at NER lesions that are marked by XPC and verified by TFIIH. XPA almost interacts with all NER proteins; hence, it is considered to be a central coordinator of the NER complex. XPA diverse function includes stimulating lesion verification by TFIIH26 and binding to altered nucleotides in ssDNA. RPA, a single-strand binding protein, protects undamaged DNA from endonucleases and also does the proper orientation of XPF–ERCC1 and XPG to specifically incise only where the damage occurred/recognized. XPG is recruited by TFIIH, is essential to enable XPF–ERCC1 to make the 5′ incision, which is sufficient to initiate gap-filling DNA synthesis even before the XPG-mediated 3′ incision is made. DNA gap-filling synthesis and ligation are executed by the replication proteins proliferating cell nuclear antigen (PCNA), replication factor C, DNA Pol δ, DNA Pol ε, or DNA Pol κ, and DNA ligase 1 or XRCC1–DNA ligase 3, which specific proteins are involved depends on the proliferative status of the cell. DNA Pol ε-dependent repair and subsequent ligation by DNA ligase 1 mainly occur in replicating cells, whereas DNA Pol δ and DNA Pol κ are the main NER polymerases in nonreplicating cells, in which nucleotide pool concentrations are low. The expression of DNA ligase 1 is also low in noncycling cells, and under these circumstances, the constitutively present XRCC1–DNA ligase 3 complex seals the gap [Figure 2]. The pivotal role of NER in preventing cells from damages induced by UVR has been well exemplified in patients with the autosomal recessive condition xeroderma pigmentosum (XP); these patients have more than 1000-fold increased incidents of skin cancers in comparison to general population. Patients affected by this syndrome develop skin cancers mostly in sun-exposed areas.,, A novel mutation in the XPA gene results in two truncated protein variants and leads to a severe XP/neurological symptoms phenotype. It is well established that UVR is involved in all three stages of carcinogenesis. UVR radiation acts as both tumor initiator and tumor promoter in several animal models. The development of UVR-mediated skin cancer is a complex multistage process including a three-step initiation-promotion-progression system mediated through various cellular, biochemical, and molecular changes. Initiation is the irreversible process, by which normal keratinocytes acquire (through somatic mutations) the irreversible capacity to form tumors. Promotion is a largely reversible process during which a clone of initiated keratinocytes expands to form a papilloma. During the process of tumor progression, a series of genetic and epigenetic events transforms the premalignant papilloma into a malignant SCC. These genetic alterations mainly occur in proto-oncogenes and tumor suppressor genes, these eventually make the cells become resistant to signals for terminal differentiation. Chronic UV exposure induces clones of cells overexpressing mutant p53 in the interfollicular epidermis and subsequently SCCs with similar p53 mutations. Mutated p53 may give cells growth advantage over neighboring cells by impaired apoptosis. Ambothi et al. (2015) reported mutated p53 expression in the tumor of chronic irradiated mouse skin. UVR-induced skin tumors progress from foci of epithelial hyperplasia to papillomas and ultimately into squamous cell and spindle cell carcinomas., Gunaseelan et al. demonstrated chronic UVB-mediated proliferative markers expression and subsequent skin carcinogenesis in experimental animals. UVR exposure induces DNA damage, photoaging, and malignant transformation in the skin. UVR activates signaling cascades that promote the survival of potentially malignant cells, resulting in tumor initiation. The UVR-induced stress response in the skin is multifaceted and involves coordinated activation of numerous pathways controlling DNA damage repair, inflammation, and kinase-mediated signal transduction that lead to either cell survival or cell death. UVA-mediated ROS generation appears to be critical for the activation of signal transduction cascades such as mitogen-activated protein kinases (MAPKs) (p38, ERK, and Jun N-terminal kinase [JNK]). In fibroblasts, UVA-activated p38 and JNK have been reported with the formation of photosensitized singlet oxygen. These MAPK subfamily members activated in response to UVR potentially contribute to cell survival. It is well known that ROS generation during the UVR exposure in human keratinocytes activates estimated glomerular filtration rate/ERK1/2 and p38 signaling pathways. Similarly, sublethal doses of UVB potentially activate JNK/SAPK family of MAPK. It has been proved that low-dose UVB irradiation induces rapid and reversible phosphorylation of JNK and p38. Muthusamy and Piva showed that the UVB-stimulated tumor necrosis factor (TNF)-α release from human melanocyte and melanoma cells was mediated by p38 MAPK in human melanocytes. It has also been demonstrated that AP-1 plays a role in the promotion of UVB-induced skin tumors. The use of a dominant-negative c-jun (TAM-67) resulted in 58% reduction in the number of tumors per mouse and a 79% reduction in the size of tumors resulting from UVB (10 kJ/m 2) exposure. UV-mediated tumor promotion and progression could involve angiogenic responses in the epidermis through enhanced expression of AP-1-regulated angiogenic factors. Further such increased vascularity could be required for early development and subsequent malignant tumor development. Cyclooxygenase-2 (COX-2) overexpression and elevated PGE2 levels have been demonstrated in both premalignant skin lesions and skin cancers. UVR directly induces COX-2 in human skin cells, further it activates p38, which is responsible for the stabilization of COX-2 mRNA, leading to increases in protein expression. In addition, UVR activates a wide range of genes involved in proinflammatory, photoimmunosuppression, and photocarcinogenesis, including interleukin (IL)-1, IL-6, TNF-α, heme oxygenase-1, matrix metalloproteinase-1 (MMP-1), and STAT3; these all favor tumor progression and invasion., Single UVB (180 mJ/cm 2) exposure to the skin of SKH-1 hairless mice resulted in significant upregulation in (i) protein levels of STAT3 and (ii) phosphorylation of STAT3 at tyrosine705. Furthermore, the activation of STAT3 was found to be associated with a decrease in apoptotic response of UVB and a gradual time-dependent increase in hyperplasia. Agilan et al. showed that chronic UVB irradiation (180 mJ/cm 2; thrice weekly for 30 weeks) induces the expression of IL-10 and JAK1 that eventually activates the STAT3 which leads to the transcription of proliferative and antiapoptotic markers such as PCNA, Cyclin-D1, Bcl-2, and Bcl-xl in mouse skin. Changes in microRNA (miRNA) expression have been shown to be associated with induction and progression of malignant melanoma, the most lethal form of skin cancer., UV irradiation of human primary keratinocytes modulates the expression of several cellular miRNAs. A common set of miRNAs was influenced by exposure to both UVA and UVB. However, each wavelength band also activated a distinct subset of miRNAs. Several investigations indicate that the differentially expressed miRNAs responding to UV have potential functions in the cellular pathways of cell growth and proliferation. It has been reported that the expression of miR-23b, which is a differentiation marker of human keratinocytes, is remarkably upregulated after UVA irradiation. Pothof et al. showed that miRNA-mediated gene silencing modulates the UVC-induced DNA damage response. Guo et al. investigated UVB-regulated miRNAs in the mouse cell line NIH3T3. Dziunycz et al. investigated the expression of miR-21, miR-203, and miR-205 after UVA and UVB irradiation in human keratinocytes. Zhou et al. listed the global miRNA expression changes in human keratinocytes after UVB irradiation. Singh et al. showed UVR-induced TNF-α on the development of cutaneous SCC and differential epidermal expression of miRNAs. The incidences of skin cancers resulting from chronic UVR exposure are on the increase globally. Hence, the cellular and molecular pathways that are associated with UVR-induced photocarcinogenesis need to be unambiguously elucidated, to develop more robust preventative and treatment strategies against UVR-induced skin cancers.In vitro investigations into the effects of UVR have, to date, mainly involved the use of cell culture and animal models. There were several models employed for the analysis of UVR-induced cellular and molecular changes. These include cellular models such as skin keratinocytes, melanocytes, fibroblasts, and animal models such as hairless SKH-1, Swiss albino mice, and genetically engineered mouse models. [Table 2] illustrates various experimental models employed in UVR-mediated carcinogenesis, inflammation, and oxidative changes. Hairless mice are valuable for experimental carcinogenesis studies. Carcinogens, promoters, chemopreventive agents, and chemotherapeutic compounds are readily applied to unperturbed hairless skin. Hairless mouse develops multiple independent skin tumors, which may exhibit significant differences in rate of development and aggressiveness. Skin tumors can be induced in hairless mice by chronic exposure to UVR. These unpigmented and immunocompetent mice allow for ready manipulation of the skin, application of topical agents, and exposure to UVR, as well as easy visualization of the cutaneous response. Wound healing, acute photobiologic responses, and skin carcinogenesis have been extensively studied in SKH-1 mice and are well characterized. In addition, tumors induced in these mice resemble, both at the morphologic and molecular levels, UVR-induced skin malignancies in man. Esteve et al. showed the role of LKB1 in a UV-dependent mouse skin cancer model and show that LKB1 haploinsufficiency is enough to impede UVB-induced DNA damage repair, contributing to tumor development driven by aberrant growth factor signaling. Bald et al. studied repetitive UV exposure in a genetically engineered mouse model and observed inflammation and metastatic progression with respect to reactive angiotropism. The use of a cell culture model has the advantage of providing a controlled environment to study a wide variety of cellular phenomena. Modern tissue culture technology has made it possible to generate human skin equivalents (HSEs) that represent epidermis (keratinocytes), dermis (fibroblasts), and epidermis plus dermis (full-thickness skin) in vitro in relation to UVR-induced skin carcinogenesis including screening of various pharmaceutical compounds. Skin epidermal melanocytes, keratinocytes, and dermal fibroblasts are the widely accepted models for the study of UV-induced changes in gene expression, telomere shortening, and signal transduction pathways. Solar irradiation effectively reaches through the upper epidermal layers of the skin into the human dermis and dermal capillary system. Up to 50% of UVA can reach the depth of melanocytes and the dermal compartment, but in the case of UVB, only 14% reaches the lower epidermis. It is estimated that photon energy delivered into the lower epidermis and upper dermis is 100 folds higher in the UVA region than in the UVB region. Photooxidative mechanisms of light-driven ROS formation have been demonstrated in cultured human melanocytes. Skin melanocytes from intact murine and human skin are widely accepted as contributors to skin photoaging and carcinogenesis. Huh et al. employed human keratinocytes for understanding UVB-induced MMP-1 expression. Kim et al. investigated the involvement of hedgehog (Hh) signaling in the photoaging process as well as the use of an Hh-regulating alkaloid compound as a novel therapeutic drug to regulate photoaging in keratinocytes. Boros (2015) investigated microarray analyses to understand the contribution of CPDs during UVB-induced changes of gene expression by transfecting keratinocytes with pseudouridine-modified mRNA (Ψ-mRNA) encoding CPD-photolyase. Robinson and Werth illustrated the role of UV light in the pathogenesis of keratinocyte apoptosis, transport of nucleoprotein autoantigens to the keratinocyte cell surface, and the release of inflammatory cytokines (including interferons, TNF-α, IL-1, IL-6, IL-8, IL-10, and IL-17). UVR is the major risk factor for causing skin melanoma. Recently, Zhao et al. studied UVR-induced skin cancer in melanocytes, and they found that Sestrin 2 (Sesn2), a member of the evolutionarily conserved stress-inducible protein family Sesn, is upregulated in human melanomas through the p53 and AKT3 pathways. Espinha et al. documented that RhoA, a GTPase inhibition, caused less efficient DNA repair, with elevated levels of DNA lesions such as strand breaks and CPDs, thereby increasing the sensitivity of melanoma cells to UVR effects. Fukumoto et al. studied the involvement of myeloid cell leukemia-1 (Mcl-1 L) in the regulation of UVB-induced apoptosis in melanocytes and found that overexpression of Mcl-1 L noticed possibly by the MEK-ERK-pS-STAT3 pathway, protects melanocytes, and melanoma cells from UVB-induced apoptosis. Cordeiro-Stone et al. studied functional ability intra-S checkpoint during melanoma development by exposing proliferating cultures of skin melanocytes, fibroblasts, and melanoma cell lines to increasing influences of UVC. It has been found that primary melanocytes displayed reduced UVC-induced inhibition of DNA strand growth and enhanced degradation of p21Waf1 after UVC than fibroblasts. Scott et al. investigated the regulation of the human melanocortin 1 receptor (MC1R) expression in cultured normal human melanocytes by UVR. Begovic et al. investigated the mechanism of DNA damage and how cells avoid consequences of damaged DNA in response to UVC exposure in mouse fibroblast – FADD deficient model. Wang et al. studied the role of hyaluronan synthase-2 against environmental stress including UVR-induced apoptosis in skin fibroblasts model. Niu et al. created a photoaging model by irradiating with different doses of UVA in cultured human skin fibroblast cells to study the red lid light interferences in UVA-induced photoaging. They suggested that red light plays a key role in the antiphotoaging of human skin fibroblasts by acting on different signaling transduction pathways. Zeng et al. studied the cellular photoaging in mouse dermal fibroblast cells by exposing repeated subcytotoxic doses of UVB radiation. Karthikeyan et al. studied UVB-induced activation of nuclear factor-κB and subsequent overexpression of MMPs and inflammatory markers in human dermal fibroblast cells. Reconstructed pigmented human epidermis model, a three-dimensional (3D) HSE, shows morphological and functional characteristics similar to those of in vivo human skin. The reconstructed human skin models are proposed as an additional tool for photoprotection studies., These models possess biological disparities to native skin, which, to some extent, have limited their relevance to the in vivo situation. Fernandez et al. characterized a 3D, tissue-engineered HSE model consisting of primary human keratinocytes cultured on a dermal-derived scaffold as a representation of a more physiologically relevant platform to study keratinocyte responses to UVB radiation. von Neubeck et al. exposed an in vitro 3D human organotypic skin tissue model to low doses of high LET oxygen (O), silicon, and iron ions for studying proliferation and differentiation profiles in the skin tissue and examined the integrity of the skin's barrier function. Park et al. demonstrated that coumestrol, a metabolite of the soybean isoflavone daidzein, has a preventive effect on skin photoaging in 3D HSE model. Qiu et al. demonstrated the skin-depigmenting potential of Paeonia lactiflora root extract using reconstructed pigmented human epidermis. Dos Santos et al. studied in vitro 3D model for studying chronological epidermis aging. Hill et al. described a novel in vitro model for the investigation of early melanoma invasion, such as that which occurs in radial and vertical growth phase melanoma, within a fully humanized cutaneous microenvironment. This model possesses a unique full-thickness 3D skin equivalent (organotypic skin culture) through the incorporation of an inert porous scaffold with appropriate pore sizes to support the 3D growth and cell-cell contact of primary human dermal fibroblasts. Pendaries et al. illustrated knockdown of filaggrin in a 3D reconstructed human epidermis impairs keratinocyte differentiation for UVB-related studies. Exposure of UVR radiation is associated with a variety of harmful effects to skin cancer. Different wavebands of UVR exhibit different types of cellular and molecular changes. The UVA radiation induces ROS generation through cellular chromophores through photosensitization mechanism which are involved in inflammation and photoaging of the exposed skin. Whereas UVB radiation generates CPDs and 6-4 PPs that mediate mutations in tumor suppressor genes which are involved in the process of tumor initiation in the exposed human skin, both UVA and UVB radiations elicit several signal transduction pathways that result in various carcinogenic events. UVR-mediated carcinogenesis has been well studied in various experimental models. Primary cultures of skin melanocytes, keratinocytes, and dermal fibroblasts served as excellent models for the study of UVA- and UVB-mediated cellular and molecular changes. Further, several 3D cellular models mimicking human skin has recently been developed for the study of UVR-mediated carcinogenesis. The authors greatly acknowledge the Department of Science and Technology (DST), Government of India, New Delhi, for providing financial assistance to Dr. G. Kanimozhi under DST-SERB scheme (File No: SB/YS/LS-90/2013 dated October 04, 2013). Kwan-Hoong N. Non-Ionizing Radiation, Biological Effects, Emissions and Exposures. In Proceedings of the International Conference on Non-Ionizing Radiation at UNITEN; 2003. p. 1-16. Tsibadze A, Chikvaidze E, Katsitadze A, Kvachadze I, Tskhvediani N, Chikviladze A. Visible light and human skin (Review). Georgian Med News 2015;246:46-53. Armstrong BK, Kricker A. The epidemiology of UV induced skin cancer. J Photochem Photobiol B 2001;63:8-18. Roos WP, Kaina B. DNA damage-induced cell death: From specific DNA lesions to the DNA damage response and apoptosis. Cancer Lett 2013;332:237-48. Cadet J, Douki T, Ravanat JL. Oxidatively generated damage to cellular DNA by UVB and UVA radiation. Photochem Photobiol 2015;91:140-55. Mallet JD, Dorr MM, Drigeard Desgarnier MC, Bastien N, Gendron SP, Rochette PJ. Faster DNA repair of ultraviolet-induced cyclobutane pyrimidine dimers and lower sensitivity to apoptosis in human corneal epithelial cells than in epidermal keratinocytes. PLoS One 2016;11:e0162212. Horikoshi N, Tachiwana H, Kagawa W, Osakabe A, Matsumoto S, Iwai S, et al. Crystal structure of the nucleosome containing ultraviolet light-induced cyclobutane pyrimidine dimer. Biochem Biophys Res Commun 2016;471:117-22. Cannistraro VJ, Pondugula S, Song Q, Taylor JS. Rapid deamination of cyclobutane pyrimidine dimer photoproducts at TCG sites in a translationally and rotationally positioned nucleosome in vivo. J Biol Chem 2015;290:26597-609. Song Q, Cannistraro VJ, Taylor JS. Synergistic modulation of cyclobutane pyrimidine dimer photoproduct formation and deamination at a TmCG site over a full helical DNA turn in a nucleosome core particle. Nucleic Acids Res 2014;42:13122-33. Rastogi RP, Kumar A, Tyagi MB, Sinha RP. Molecular mechanisms of ultraviolet radiation-induced DNA damage and repair. J Nucleic Acids 2010;2010:592980. Limoli CL, Giedzinski E, Bonner WM, Cleaver JE. UV-induced replication arrest in the xeroderma pigmentosum variant leads to DNA double-strand breaks, gamma -H2AX formation, and Mre11 relocalization. Proc Natl Acad Sci U S A 2002;99:233-8. Batista LF, Kaina B, Meneghini R, Menck CF. How DNA lesions are turned into powerful killing structures: Insights from UV-induced apoptosis. Mutat Res 2009;681:197-208. Nováková E, Vyšín L, Burian T, Juha L, Davídková M, Múčka V, Čuba V, Grisham ME, Heinbuch S, Rocca JJ. Breaking DNA strands by extreme-ultraviolet laser pulses in vacuum. Phys Rev E Stat Nonlin Soft Matter Phys 2015;91:042718. Dunkern TR, Kaina B. Cell proliferation and DNA breaks are involved in ultraviolet light-induced apoptosis in nucleotide excision repair-deficient Chinese hamster cells. Mol Biol Cell 2002;13:348-61. Takahashi A, Ohnishi T. Does gammaH2AX foci formation depend on the presence of DNA double strand breaks? Cancer Lett 2005;229:171-9. Takeuchi T, Uitto J, Bernstein EF. A novel in vivo model for evaluating agents that protect against ultraviolet A-induced photoaging. J Invest Dermatol 1998;110:343-7. Baier J, Maisch T, Maier M, Engel E, Landthaler M, Bäumler W. Singlet oxygen generation by UVA light exposure of endogenous photosensitizers. Biophys J 2006;91:1452-9. Draper DO, Sunderland S. Examination of the law of grotthus-draper: Does ultrasound penetrate subcutaneous fat in humans? J Athl Train 1993;28:246-50. Wondrak GT, Jacobson MK, Jacobson EL. Endogenous UVA-photosensitizers: Mediators of skin photodamage and novel targets for skin photoprotection. Photochem Photobiol Sci 2006;5:215-37. Zhang X, Rosenstein BS, Wang Y, Lebwohl M, Wei H. Identification of possible reactive oxygen species involved in ultraviolet radiation-induced oxidative DNA damage. Free Radic Biol Med 1997;23:980-5. Ravanat JL, Douki T, Cadet J. Direct and indirect effects of UV radiation on DNA and its components. J Photochem Photobiol B 2001;63:88-102. Dong TK, Ona K, Scandurra AE, Demetriou SK, Oh DH. Deficient nucleotide excision repair in squamous cell carcinoma cells. Photochem Photobiol 2016;92:760-6. Park JM, Kang TH. Transcriptional and posttranslational regulation of nucleotide excision repair: The guardian of the genome against ultraviolet radiation. Int J Mol Sci 2016;17. pii: E1840. Gillet LC, Schärer OD. Molecular mechanisms of mammalian global genome nucleotide excision repair. Chem Rev 2006;106:253-76. Velmurugu Y, Chen X, Slogoff Sevilla P, Min JH, Ansari A. Twist-open mechanism of DNA damage recognition by the Rad4/XPC nucleotide excision repair complex. Proc Natl Acad Sci U S A 2016;113:E2296-305. Li J, Wang QE, Zhu Q, El-Mahdy MA, Wani G, Praetorius-Ibba M, et al. DNA damage binding protein component DDB1 participates in nucleotide excision repair through DDB2 DNA-binding and cullin 4A ubiquitin ligase activity. Cancer Res 2006;66:8590-7. Yokoi M, Masutani C, Maekawa T, Sugasawa K, Ohkuma Y, Hanaoka F. The xeroderma pigmentosum group C protein complex XPC-HR23B plays an important role in the recruitment of transcription factor IIH to damaged DNA. J Biol Chem 2000;275:9870-5. Rouillon C, White MF. The evolution and mechanisms of nucleotide excision repair proteins. Res Microbiol 2011;162:19-26. Fuss JO, Tainer JA. XPB and XPD helicases in TFIIH orchestrate DNA duplex opening and damage verification to coordinate repair with transcription and cell cycle via CAK kinase. DNA Repair (Amst) 2011;10:697-713. Thoma BS, Vasquez KM. Critical DNA damage recognition functions of XPC-hHR23B and XPA-RPA in nucleotide excision repair. Mol Carcinog 2003;38:1-13. Niedernhofer LJ, Odijk H, Budzowska M, van Drunen E, Maas A, Theil AF, et al. The structure-specific endonuclease Ercc1-Xpf is required to resolve DNA interstrand cross-link-induced double-strand breaks. Mol Cell Biol 2004;24:5776-87. Volker M, Moné MJ, Karmakar P, van Hoffen A, Schul W, Vermeulen W, et al. Sequential assembly of the nucleotide excision repair factors in vivo. Mol Cell 2001;8:213-24. Schärer OD. Nucleotide excision repair in eukaryotes. Cold Spring Harb Perspect Biol 2013;5:a012609. Mareddy S, Reddy J, Babu S, Balan P. Xeroderma pigmentosum: Man deprived of his right to light. ScientificWorldJournal 2013;2013:534752. Hua RX, Zhuo ZJ, Shen GP, Zhu J, Zhang SD, Xue WQ, et al. Polymorphisms in the XPC gene and gastric cancer susceptibility in a Southern Chinese population. Onco Targets Ther 2016;9:5513-9. Kahnamouei SA, Narouie B, Sotoudeh M, Mollakouchekian MJ, Simforoosh N, Ziaee SA, et al. Association of XPC gene polymorphisms with prostate cancer risk. Clin Lab 2016;62:1009-15. Schubert S, Rieper P, Ohlenbusch A, Seebode C, Lehmann J, Gratchev A, et al. A unique chromosomal in-frame deletion identified among seven XP-C patients. Photodermatol Photoimmunol Photomed 2016;32:276-283. Takahashi Y, Endo Y, Kusaka A, Nakamaura S, Nakazawa Y, Ogi T, et al. An XPA gene splicing mutation resulting in trace protein expression in an elderly xeroderma pigmentosum group A patient without neurological abnormalities. Br J Dermatol 2016. [Epub ahead of print]. Bachelor MA, Bowden GT. UVA-mediated activation of signaling pathways involved in skin tumor promotion and progression. Semin Cancer Biol 2004;14:131-8. Radhiga T, Agilan B, Muzaffer U, Karthikeyan R, Kanimozhi G, Paul VI, et al. Phytochemicals as modulators of ultraviolet-b radiation induced cellular and molecular events: A review. J Radiat Cancer Res 2016;7:2. Bode AM, Dong Z. 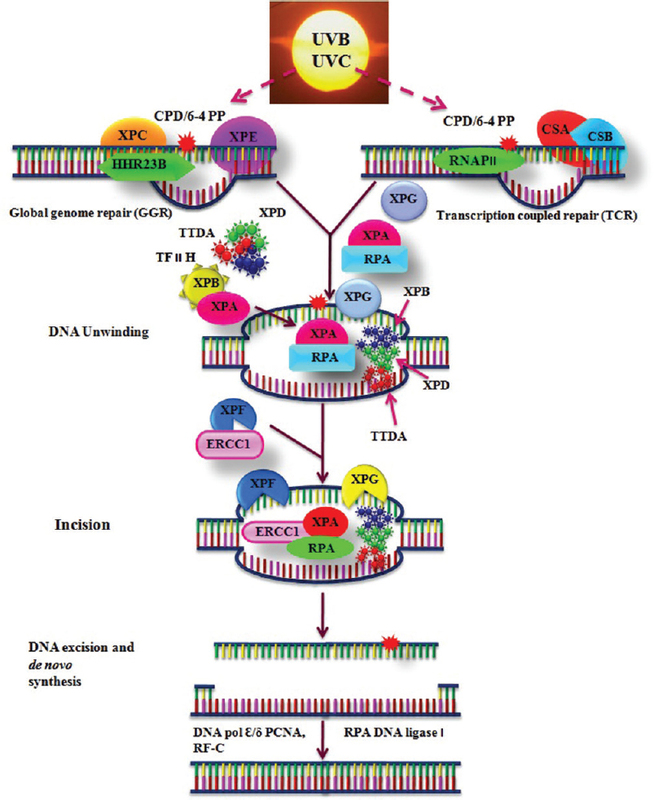 Signal transduction pathways: Targets for chemoprevention of skin cancer. Lancet Oncol 2000;1:181-8. Yang A, Currier D, Poitras JL, Reeves RH. Increased skin tumor incidence and keratinocyte hyper-proliferation in a mouse model of Down syndrome. PLoS One 2016;11:e0146570. Arvelo F, Sojo F, Cotte C. Tumour progression and metastasis. Ecancermedicalscience 2016;10:617. Rebel HG, Bodmann CA, van de Glind GC, de Gruijl FR. UV-induced ablation of the epidermal basal layer including p53-mutant clones resets UV carcinogenesis showing squamous cell carcinomas to originate from interfollicular epidermis. Carcinogenesis 2012;33:714-20. Ambothi K, Prasad NR, Balupillai A. Ferulic acid inhibits UVB-radiation induced photocarcinogenesis through modulating inflammatory and apoptotic signaling in Swiss albino mice. Food Chem Toxicol 2015;82:72-8. Daya-Grosjean L, Sarasin A. The role of UV induced lesions in skin carcinogenesis: An overview of oncogene and tumor suppressor gene modifications in xeroderma pigmentosum skin tumors. Mutat Res 2005;571:43-56. Gunaseelan S, Balupillai A, Govindasamy K, Muthusamy G, Ramasamy K, Shanmugam M, et al. The preventive effect of linalool on acute and chronic UVB-mediated skin carcinogenesis in Swiss albino mice. Photochem Photobiol Sci 2016;15:851-60. Feehan RP, Shantz LM. Molecular signaling cascades involved in nonmelanoma skin carcinogenesis. Biochem J 2016;473:2973-94. Muthusamy V, Piva TJ. The UV response of the skin: A review of the MAPK, NFkappaB and TNFalpha signal transduction pathways. Arch Dermatol Res 2010;302:5-17. Klotz LO, Pellieux C, Briviba K, Pierlot C, Aubry JM, Sies H. Mitogen-activated protein kinase (p38-, JNK-, ERK-) activation pattern induced by extracellular and intracellular singlet oxygen and UVA. Eur J Biochem 1999;260:917-22. Peus D, Vasa RA, Beyerle A, Meves A, Krautmacher C, Pittelkow MR. UVB activates ERK1/2 and p38 signaling pathways via reactive oxygen species in cultured keratinocytes. J Invest Dermatol 1999;112:751-6. Ren X, Shi Y, Zhao D, Xu M, Li X, Dang Y, et al. Naringin protects ultraviolet B-induced skin damage by regulating p38 MAPK signal pathway. J Dermatol Sci 2016;82:106-14. Muthusamy V, Piva TJ. UVB-stimulated TNFa release from human melanocyte and melanoma cells is mediated by p38 MAPK. Int J Mol Sci 2013;14:17029-54.
Cooper SJ, MacGowan J, Ranger-Moore J, Young MR, Colburn NH, Bowden GT. Expression of dominant negative c-jun inhibits ultraviolet B-induced squamous cell carcinoma number and size in an SKH-1 hairless mouse model. Mol Cancer Res 2003;1:848-54. Agilan B, Rajendra Prasad N, Kanimozhi G, Karthikeyan R, Ganesan M, Mohana S, et al. Caffeic acid inhibits chronic UVB-induced cellular proliferation through JAK-STAT3 signaling in mouse skin. Photochem Photobiol 2016;92:467-74. Ahsan H, Aziz MH, Ahmad N. Ultraviolet B exposure activates Stat3 signaling via phosphorylation at tyrosine705 in skin of SKH1 hairless mouse: A target for the management of skin cancer? Biochem Biophys Res Commun 2005;333:241-6. Mueller DW, Rehli M, Bosserhoff AK. miRNA expression profiling in melanocytes and melanoma cell lines reveals miRNAs associated with formation and progression of malignant melanoma. J Invest Dermatol 2009;129:1740-51. Sand M, Skrygan M, Sand D, Georgas D, Gambichler T, Hahn SA, et al. Comparative microarray analysis of microRNA expression profiles in primary cutaneous malignant melanoma, cutaneous malignant melanoma metastases, and benign melanocytic nevi. Cell Tissue Res 2013;351:85-98. Kraemer A, Chen IP, Henning S, Faust A, Volkmer B, Atkinson MJ, et al. UVA and UVB irradiation differentially regulate microRNA expression in human primary keratinocytes. PLoS One 2013;8:e83392. Pothof J, Verkaik NS, van IJcken W, Wiemer EA, Ta VT, van der Horst GT, et al. MicroRNA-mediated gene silencing modulates the UV-induced DNA-damage response. EMBO J 2009;28:2090-9. Guo L, Huang ZX, Chen XW, Deng QK, Yan W, Zhou MJ, et al. Differential expression profiles of microRNAs in NIH3T3 cells in response to UVB irradiation. Photochem Photobiol 2009;85:765-73. Dziunycz P, Iotzova-Weiss G, Eloranta JJ, Läuchli S, Hafner J, French LE, et al. Squamous cell carcinoma of the skin shows a distinct microRNA profile modulated by UV radiation. J Invest Dermatol 2010;130:2686-9. Zhou BR, Xu Y, Permatasari F, Liu WL, Li W, Guo XF, et al. Characterization of the miRNA profile in UVB-irradiated normal human keratinocytes. Exp Dermatol 2012;21:317-9. Singh A, Willems E, Singh A, Hafeez BB, Ong IM, Mehta SL, et al. Ultraviolet radiation-induced tumor necrosis factor alpha, which is linked to the development of cutaneous SCC, modulates differential epidermal microRNAs expression. Oncotarget 2016;7:17945-56. Archambault M, Yaar M, Gilchrest BA. Keratinocytes and fibroblasts in a human skin equivalent model enhance melanocyte survival and melanin synthesis after ultraviolet irradiation. J Invest Dermatol 1995;104:859-67. Yang TH, Lai YH, Lin TP, Liu WS, Kuan LC, Liu CC. Chronic exposure to Rhodobacter sphaeroides extract Lycogen™ prevents UVA-induced malondialdehyde accumulation and procollagen I down-regulation in human dermal fibroblasts. Int J Mol Sci 2014;15:1686-99. Panich U, Pluemsamran T, Tangsupa-a-nan V, Wattanarangsan J, Phadungrakwittaya R, Akarasereenont P, et al. Protective effect of AVS073, a polyherbal formula, against UVA-induced melanogenesis through a redox mechanism involving glutathione-related antioxidant defense. BMC Complement Altern Med 2013;13:159. Murray HC, Maltby VE, Smith DW, Bowden NA. Nucleotide excision repair deficiency in melanoma in response to UVA. Exp Hematol Oncol 2016;5:6. Brem R, Li F, Karran P. Reactive oxygen species generated by thiopurine/UVA cause irreparable transcription-blocking DNA lesions. Nucleic Acids Res 2009;37:1951-61. Reelfs O, Macpherson P, Ren X, Xu YZ, Karran P, Young AR. Identification of potentially cytotoxic lesions induced by UVA photoactivation of DNA 4-thiothymidine in human cells. Nucleic Acids Res 2011;39:9620-32. Greinert R, Volkmer B, Henning S, Breitbart EW, Greulich KO, Cardoso MC, et al. UVA-induced DNA double-strand breaks result from the repair of clustered oxidative DNA damages. Nucleic Acids Res 2012;40:10263-73. Silvers AL, Bachelor MA, Bowden GT. The role of JNK and p38 MAPK activities in UVA-induced signaling pathways leading to AP-1 activation and c-Fos expression. Neoplasia 2003;5:319-29. Boyer JZ, Jandova J, Janda J, Vleugels FR, Elliott DA, Sligh JE. Resveratrol-sensitized UVA induced apoptosis in human keratinocytes through mitochondrial oxidative stress and pore opening. J Photochem Photobiol B 2012;113:42-50. Zhao B, Ming M, He YY. Suppression of PTEN transcription by UVA. J Biochem Mol Toxicol 2013;27:184-91. Kawano A, Kadomatsu R, Ono M, Kojima S, Tsukimoto M, Sakamoto H. Autocrine regulation of UVA-induced IL-6 production via release of ATP and activation of P2Y receptors. PLoS One 2015;10:e0127919. Nechifor MT, Niculite CM, Urs AO, Regalia T, Mocanu M, Popescu A, et al. UVA irradiation of dysplastic keratinocytes: Oxidative damage versus antioxidant defense. Int J Mol Sci 2012;13:16718-36. Chan CM, Huang CH, Li HJ, Hsiao CY, Su CC, Lee PL, et al. Protective effects of resveratrol against UVA-induced damage in ARPE cells. Int J Mol Sci 2015;16:5789-802. Chaiprasongsuk A, Onkoksoong T, Pluemsamran T, Limsaengurai S, Panich U. Photoprotection by dietary phenolics against melanogenesis induced by UVA through Nrf2-dependent antioxidant responses. Redox Biol 2016;8:79-90. Chan CM, Huang JH, Lin HH, Chiang HS, Chen BH, Hong JY, et al. Protective effects of (-)-epigallocatechin gallate on UVA-induced damage in ARPE19 cells. Mol Vis 2008;14:2528-34. Redmond RW, Rajadurai A, Udayakumar D, Sviderskaya EV, Tsao H. Melanocytes are selectively vulnerable to UVA-mediated bystander oxidative signaling. J Invest Dermatol 2014;134:1083-90. Padgaonkar VA, Leverenz VR, Bhat AV, Pelliccia SE, Giblin FJ. Thioredoxin reductase activity may be more important than GSH level in protecting human lens epithelial cells against UVA light. Photochem Photobiol 2015;91:387-96. Girard PM, Graindorge D, Smirnova V, Rigolet P, Francesconi S, Scanlon S, et al. Oxidative stress in mammalian cells impinges on the cysteines redox state of human XRCC3 protein and on its cellular localization. PLoS One 2013;8:e75751. Brugè F, Tiano L, Astolfi P, Emanuelli M, Damiani E. Prevention of UVA-induced oxidative damage in human dermal fibroblasts by new UV filters, assessed using a novel in vitro experimental system. PLoS One 2014;9:e83401. Graindorge D, Martineau S, Machon C, Arnoux P, Guitton J, Francesconi S, et al. Singlet oxygen-mediated oxidation during UVA radiation alters the dynamic of genomic DNA replication. PLoS One 2015;10:e0140645. Reelfs O, Abbate V, Hider RC, Pourzand C. A powerful mitochondria-targeted iron chelator affords high photoprotection against solar ultraviolet A radiation. J Invest Dermatol 2016;136:1692-700. Sayama A, Soushin T, Okada T, Doi K, Nakayama H. Morphological and biochemical changes during aging and photoaging of the skin of C57BL/6J mice. J Toxicol Pathol 2010;23:133-9. Reeve VE, Tyrrell RM. Heme oxygenase induction mediates the photoimmunoprotective activity of UVA radiation in the mouse. Proc Natl Acad Sci U S A 1999;96:9317-21. Chang PL, Hsieh YH, Wang CC, Juliana MM, Tsuruta Y, Timares L, et al. Osteopontin facilitates ultraviolet B-induced squamous cell carcinoma development. J Dermatol Sci 2014;75:121-32. Chen A, Huang X, Xue Z, Cao D, Huang K, Chen J, et al. The role of p21 in apoptosis, proliferation, cell cycle arrest, and antioxidant activity in UVB-irradiated human HaCaT keratinocytes. Med Sci Monit Basic Res 2015;21:86-95. Shin SW, Jung E, Kim S, Kim JH, Kim EG, Lee J, et al. Antagonizing effects and mechanisms of afzelin against UVB-induced cell damage. PLoS One 2013;8:e61971. Mortensen LJ, Faulknor R, Ravichandran S, Zheng H, DeLouise LA. UVB dependence of quantum dot reactive oxygen species generation in common skin cell models. J Biomed Nanotechnol 2015;11:1644-52. Blauvelt A, Asada H, Klaus-Kovtun V, Altman DJ, Lucey DR, Katz SI. Interleukin-15 mRNA is expressed by human keratinocytes Langerhans cells, and blood-derived dendritic cells and is downregulated by ultraviolet B radiation. J Invest Dermatol 1996;106:1047-52. Terazawa S, Mori S, Nakajima H, Yasuda M, Imokawa G. The UVB-stimulated expression of transglutaminase 1 is mediated predominantly via the NFκB signaling pathway: New evidence of its significant attenuation through the specific interruption of the p38/MSK1/NFκBp65 Ser276 Axis. PLoS One 2015;10:e0136311. Tyagi N, Bhardwaj A, Srivastava SK, Arora S, Marimuthu S, Deshmukh SK, et al. Development and characterization of a novel in vitro progression model for UVB-induced skin carcinogenesis. Sci Rep 2015;5:13894. Lee H, Lee JY, Song KC, Kim J, Park JH, Chun KH, et al. Protective effect of processed Panax ginseng, Sun Ginseng on UVB-irradiated human skin keratinocyte and human dermal fibroblast. J Ginseng Res 2012;36:68-77. Jung SK, Ha SJ, Jung CH, Kim YT, Lee HK, Kim MO, et al. Naringenin targets ERK2 and suppresses UVB-induced photoaging. J Cell Mol Med 2016;20:909-19. Wallace NA, Robinson K, Howie HL, Galloway DA. HPV 5 and 8 E6 abrogate ATR activity resulting in increased persistence of UVB induced DNA damage. PLoS Pathog 2012;8:e1002807. Ortolan TG, Menck CF. UVB-induced cell death signaling is associated with G1-S progression and transcription inhibition in primary human fibroblasts. PLoS One 2013;8:e76936. Lee H, Morales LD, Slaga TJ, Kim DJ. Activation of T-cell protein-tyrosine phosphatase suppresses keratinocyte survival and proliferation following UVB irradiation. J Biol Chem 2015;290:13-24. Bertrand-Vallery V, Belot N, Dieu M, Delaive E, Ninane N, Demazy C, et al. Proteomic profiling of human keratinocytes undergoing UVB-induced alternative differentiation reveals TRIpartite Motif Protein 29 as a survival factor. PLoS One 2010;5:e10462. Jian Q, An Q, Zhu D, Hui K, Liu Y, Chi S, et al. MicroRNA 340 is involved in UVB-induced dendrite formation through the regulation of RhoA expression in melanocytes. Mol Cell Biol 2014;34:3407-20. Hall JR, Messenger ZJ, Tam HW, Phillips SL, Recio L, Smart RC. Long noncoding RNA lincRNA-p21 is the major mediator of UVB-induced and p53-dependent apoptosis in keratinocytes. Cell Death Dis 2015;6:e1700. Narayanapillai S, Agarwal C, Deep G, Agarwal R. Silibinin inhibits ultraviolet B radiation-induced DNA-damage and apoptosis by enhancing interleukin-12 expression in JB6 cells and SKH-1 hairless mouse skin. Mol Carcinog 2014;53:471-9. Smith KA, Tong X, Abu-Yousif AO, Mikulec CC, Gottardi CJ, Fischer SM, et al. UVB radiation-induced ß-catenin signaling is enhanced by COX-2 expression in keratinocytes. Mol Carcinog 2012;51:734-45. Yin Y, Li W, Son YO, Sun L, Lu J, Kim D, et al. Quercitrin protects skin from UVB-induced oxidative damage. Toxicol Appl Pharmacol 2013;269:89-99. Prasad NR, Mahesh T, Menon VP, Jeevanram RK, Pugalendi KV. Photoprotective effect of sesamol on UVB-radiation induced oxidative stress in human blood lymphocytes in vitro. Environ Toxicol Pharmacol 2005;20:1-5. Prasad NR, Jeyanthimala K, Ramachandran S. Caffeic acid modulates ultraviolet radiation-B induced oxidative damage in human blood lymphocytes. J Photochem Photobiol B 2009;95:196-203. Ramachandran S, Rajendra Prasad N, Karthikeyan S. Sesamol inhibits UVB-induced ROS generation and subsequent oxidative damage in cultured human skin dermal fibroblasts. Arch Dermatol Res 2010;302:733-44. Karthikeyan R, Kanimozhi G, Prasad NR, Agilan B, Ganesan M, Mohana S, et al. 7-Hydroxycoumarin prevents UVB-induced activation of NF-κB and subsequent overexpression of matrix metalloproteinases and inflammatory markers in human dermal fibroblast cells. J Photochem Photobiol B 2016;161:170-6. Vörsmann H, Groeber F, Walles H, Busch S, Beissert S, Walczak H, et al. Development of a human three-dimensional organotypic skin-melanoma spheroid model for in vitro drug testing. Cell Death Dis 2013;4:e719. Evans-Johnson JA, Garlick JA, Johnson EJ, Wang XD, Oliver Chen CY. A pilot study of the photoprotective effect of almond phytochemicals in a 3D human skin equivalent. J Photochem Photobiol B 2013;126:17-25. Calvo-Castro L, Syed DN, Chamcheu JC, Vilela FM, Pérez AM, Vaillant F, et al. Protective effect of tropical highland blackberry juice (Rubus adenotrichos Schltdl.) against UVB-mediated damage in human epidermal keratinocytes and in a reconstituted skin equivalent model. Photochem Photobiol 2013;89:1199-207. Rahman M, Kundu JK, Shin JW, Na HK, Surh YJ. Docosahexaenoic acid inhibits UVB-induced activation of NF-κB and expression of COX-2 and NOX-4 in HR-1 hairless mouse skin by blocking MSK1 signaling. PLoS One 2011;6:e28065. Zhang JA, Yin Z, Ma LW, Yin ZQ, Hu YY, Xu Y, et al. The protective effect of baicalin against UVB irradiation induced photoaging: An in vitro and in vivo study. PLoS One 2014;9:e99703. Vaid M, Prasad R, Singh T, Elmets CA, Xu H, Katiyar SK. Silymarin inhibits ultraviolet radiation-induced immune suppression through DNA repair-dependent activation of dendritic cells and stimulation of effector T cells. Biochem Pharmacol 2013;85:1066-76. Saw CL, Yang AY, Huang MT, Liu Y, Lee JH, Khor TO, et al. Nrf2 null enhances UVB-induced skin inflammation and extracellular matrix damages. Cell Biosci 2014;4:39. Ryser S, Schuppli M, Gauthier B, Hernandez DR, Roye O, Hohl D, et al. UVB-induced skin inflammation and cutaneous tissue injury is dependent on the MHC class I-like protein, CD1d. J Invest Dermatol 2014;134:192-202. Aoki R, Aoki-Yoshida A, Suzuki C, Takayama Y. Protective effect of indole-3-pyruvate against ultraviolet b-induced damage to cultured HaCaT keratinocytes and the skin of hairless mice. PLoS One 2014;9:e96804. Balupillai A, Prasad RN, Ramasamy K, Muthusamy G, Shanmugham M, Govindasamy K, et al. Caffeic acid inhibits UVB-induced inflammation and photocarcinogenesis through activation of peroxisome proliferator-activated receptor-γ in mouse skin. Photochem Photobiol 2015;91:1458-68. Sharma S, Khan N, Sultana S. Modulatory effect of gentisic acid on the augmentation of biochemical events of tumor promotion stage by benzoyl peroxide and ultraviolet radiation in Swiss albino mice. Toxicol Lett 2004;153:293-302. Deshmukh J, Pofahl R, Pfister H, Haase I. Deletion of epidermal Rac1 inhibits HPV-8 induced skin papilloma formation and facilitates HPV-8- and UV-light induced skin carcinogenesis. Oncotarget 2016;7:57841-50. Nonaka T, Toda Y, Hiai H, Uemura M, Nakamura M, Yamamoto N, et al. Involvement of activation-induced cytidine deaminase in skin cancer development. J Clin Invest 2016;126:1367-82. Handoko HY, Rodero MP, Muller HK, Khosrotehrani K, Walker GJ. Lack of evidence from a transgenic mouse model that the activation and migration of melanocytes to the epidermis after neonatal UVR enhances melanoma development. J Invest Dermatol 2015;135:2897-900. Ferguson B, Ram R, Handoko HY, Mukhopadhyay P, Muller HK, Soyer HP, et al. Melanoma susceptibility as a complex trait: Genetic variation controls all stages of tumor progression. Oncogene 2015;34:2879-86. Gentile M, Latonen L, Laiho M. Cell cycle arrest and apoptosis provoked by UV radiation-induced DNA damage are transcriptionally highly divergent responses. Nucleic Acids Res 2003;31:4779-90. Wano C, Kita K, Takahashi S, Sugaya S, Hino M, Hosoya H, et al. Protective role of HSP27 against UVC-induced cell death in human cells. Exp Cell Res 2004;298:584-92. Haapajärvi T, Pitkänen K, Laiho M. Human melanoma cell line UV responses show independency of p53 function. Cell Growth Differ 1999;10:163-71. Seker H, Rubbi C, Linke SP, Bowman ED, Garfield S, Hansen L, et al. UV-C-induced DNA damage leads to p53-dependent nuclear trafficking of PML. Oncogene 2003;22:1620-8. Zhang Q, Chen Y, Wang BD, He P, Su YA. Differences in apoptosis and cell cycle distribution between human melanoma cell lines UACC903 and UACC903(+6), before and after UV irradiation. Int J Biol Sci 2007;3:342-8. Tomicic MT, Reischmann P, Rasenberger B, Meise R, Kaina B, Christmann M. Delayed c-Fos activation in human cells triggers XPF induction and an adaptive response to UVC-induced DNA damage and cytotoxicity. Cell Mol Life Sci 2011;68:1785-98. Tong XB, Kita K, Chen SP, Jiang X, Sugaya S, Jing WL, et al. Involvement of heat shock protein 27 in the susceptibility of KT human breast cancer cells to UVC and interferon lethality. Exp Ther Med 2012;4:913-7. Tai MH, Weng CH, Mon DP, Hu CY, Wu MH. Ultraviolet C irradiation induces different expression of cyclooxygenase 2 in NIH 3T3 cells and A431 cells: The roles of COX-2 are different in various cell lines. Int J Mol Sci 2012;13:4351-66. Rodrigo G, Roumagnac S, Wold MS, Salles B, Calsou P. DNA replication but not nucleotide excision repair is required for UVC-induced replication protein A phosphorylation in mammalian cells. Mol Cell Biol 2000;20:2696-705. László CF, Fayad S, Carpenter OL, George KS, Lu W, Saad AA, et al. The role of translational regulation in ultraviolet C light-induced cyclooxygenase-2 expression. Life Sci 2009;85:70-6. Bess AS, Ryde IT, Hinton DE, Meyer JN. UVC-induced mitochondrial degradation via autophagy correlates with mtDNA damage removal in primary human fibroblasts. J Biochem Mol Toxicol 2013;27:28-41. Glover KP, Chen Z, Markell LK, Han X. Synergistic gene expression signature observed in TK6 cells upon co-exposure to UVC-irradiation and protein kinase C-activating tumor promoters. PLoS One 2015;10:e0139850. Sproul CD, Mitchell DL, Rao S, Ibrahim JG, Kaufmann WK, Cordeiro-Stone M. Cyclobutane pyrimidine dimer density as a predictive biomarker of the biological effects of ultraviolet radiation in normal human fibroblast. Photochem Photobiol 2014;90:145-54. Gao Y, Liu Y, Zhou L, Guo Z, Rong M, Liu X, et al. The effects of different wavelength UV photofunctionalization on micro-arc oxidized titanium. PLoS One 2013;8:e68086. Zhi L, Chi X, Vostal JG.In vitro and in vivo characterization of ultraviolet light C-irradiated human platelets in a 2 event mouse model of transfusion. PLoS One 2013;8:e79869. Ikehata H, Mori T, Yamamoto M.In vivo spectrum of UVC-induced mutation in mouse skin epidermis may reflect the cytosine deamination propensity of cyclobutane pyrimidine dimers. Photochem Photobiol 2015;91:1488-96. Benavides F, Oberyszyn TM, VanBuskirk AM, Reeve VE, Kusewitt DF. The hairless mouse in skin research. J Dermatol Sci 2009;53:10-8. Konger RL, Derr-Yellin E, Hojati D, Lutz C, Sundberg JP. Comparison of the acute ultraviolet photoresponse in congenic albino hairless C57BL/6J mice relative to outbred SKH1 hairless mice. Exp Dermatol 2016;25:688-93. Esteve-Puig R, Gil R, González-Sánchez E, Bech-Serra JJ, Grueso J, Hernández-Losa J, et al. A mouse model uncovers LKB1 as an UVB-induced DNA damage sensor mediating CDKN1A (p21WAF1/CIP1) degradation. PLoS Genet 2014;10:e1004721. Bald T, Quast T, Landsberg J, Rogava M, Glodde N, Lopez-Ramos D, et al. Ultraviolet-radiation-induced inflammation promotes angiotropism and metastasis in melanoma. Nature 2014;507:109-13. Knak A, Regensburger J, Maisch T, Bäumler W. Exposure of vitamins to UVB and UVA radiation generates singlet oxygen. Photochem Photobiol Sci 2014;13:820-9. Marrot L, Belaïdi JP, Jones C, Perez P, Meunier JR. Molecular responses to stress induced in normal human caucasian melanocytes in culture by exposure to simulated solar UV. Photochem Photobiol. 2005;81:367-75. Huh WB, Kim JE, Kang YG, Park G, Lim TG, Kwon JY, et al. Brown pine leaf extract and its active component trans-communic acid inhibit UVB-induced MMP-1 expression by targeting PI3K. PLoS One 2015;10:e0128365. Kim W, Kim E, Yang HJ, Kwon T, Han S, Lee S, et al. Inhibition of hedgehog signalling attenuates UVB-induced skin photoageing. Exp Dermatol 2015;24:611-7. Boros G, Miko E, Muramatsu H, Weissman D, Emri E, van der Horst GT, et al. Identification of cyclobutane pyrimidine dimer-responsive genes using UVB-irradiated human keratinocytes transfected with in vitro-synthesized photolyase mRNA. PLoS One 2015;10:e0131141. Robinson ES, Werth VP. The role of cytokines in the pathogenesis of cutaneous lupus erythematosus. Cytokine 2015;73:326-34. Zhao B, Shah P, Qiang L, He TC, Budanov A, He YY. Distinct role of Sesn2 in response to UVB-induced DNA damage and UVA-induced oxidative stress in melanocytes. Photochem Photobiol 2016. [Epub ahead of print]. Espinha G, Osaki JH, Costa ET, Forti FL. Inhibition of the RhoA GTPase activity increases sensitivity of melanoma cells to UV radiation effects. Oxid Med Cell Longev 2016;2016:2696952. Fukumoto T, Iwasaki T, Okada T, Hashimoto T, Moon Y, Sakaguchi M, et al. High expression of Mcl-1L via the MEK-ERK-phospho-STAT3 (Ser727) pathway protects melanocytes and melanoma from UVB-induced apoptosis. Genes Cells 2016;21:185-99. Cordeiro-Stone M, McNulty JJ, Sproul CD, Chastain PD, Gibbs-Flournoy E, Zhou Y, et al. Effective intra-S checkpoint responses to UVC in primary human melanocytes and melanoma cell lines. Pigment Cell Melanoma Res 2016;29:68-80. Scott MC, Suzuki I, Abdel-Malek ZA. Regulation of the human melanocortin 1 receptor expression in epidermal melanocytes by paracrine and endocrine factors and by ultraviolet radiation. Pigment Cell Res 2002;15:433-9. Begovic L, Antunovic M, Matic I, Furcic I, Baricevic A, Vojvoda Parcina V, et al. Effect of UVC radiation on mouse fibroblasts deficient for FAS-associated protein with death domain. Int J Radiat Biol 2016;92:475-82. Wang Y, Lauer ME, Anand S, Mack JA, Maytin EV. Hyaluronan synthase 2 protects skin fibroblasts against apoptosis induced by environmental stress. J Biol Chem 2014;289:32253-65. Niu T, Tian Y, Ren Q, Wei L, Li X, Cai Q. Red light interferes in UVA-induced photoaging of human skin fibroblast cells. Photochem Photobiol 2014;90:1349-58. Zeng JP, Bi B, Chen L, Yang P, Guo Y, Zhou YQ, et al. Repeated exposure of mouse dermal fibroblasts at a sub-cytotoxic dose of UVB leads to premature senescence: A robust model of cellular photoaging. J Dermatol Sci 2014;73:49-56. Schreiber S, Mahmoud A, Vuia A, Rübbelke MK, Schmidt E, Schaller M, et al. Reconstructed epidermis versus human and animal skin in skin absorption studies. Toxicol In Vitro 2005;19:813-22. Kejlová K, Jírová D, Bendová H, Kandárová H, Weidenhoffer Z, Kolárová H, et al. Phototoxicity of bergamot oil assessed by in vitro techniques in combination with human patch tests. Toxicol In Vitro 2007;21:1298-303. Fernandez TL, Van Lonkhuyzen DR, Dawson RA, Kimlin MG, Upton Z. Characterization of a human skin equivalent model to study the effects of ultraviolet B radiation on keratinocytes. Tissue Eng Part C Methods 2014;20:588-98.
von Neubeck C, Geniza MJ, Kauer PM, Robinson RJ, Chrisler WB, Sowa MB. The effect of low dose ionizing radiation on homeostasis and functional integrity in an organotypic human skin model. Mutat Res 2015;775:10-8. Park G, Baek S, Kim JE, Lim TG, Lee CC, Yang H, et al. Flt3 is a target of coumestrol in protecting against UVB-induced skin photoaging. Biochem Pharmacol 2015;98:473-83. Qiu J, Chen M, Liu J, Huang X, Chen J, Zhou L, et al. The skin-depigmenting potential of Paeonia lactiflora root extract and paeoniflorin: In vitro evaluation using reconstructed pigmented human epidermis. Int J Cosmet Sci 2016;38:444-51. Dos Santos M, Metral E, Boher A, Rousselle P, Thepot A, Damour O.In vitro 3-D model based on extending time of culture for studying chronological epidermis aging. Matrix Biol 2015;47:85-97. Hill DS, Robinson ND, Caley MP, Chen M, O'Toole EA, Armstrong JL, et al. A novel fully humanized 3D skin equivalent to model early melanoma invasion. Mol Cancer Ther 2015;14:2665-73. Pendaries V, Malaisse J, Pellerin L, Le Lamer M, Nachat R, Kezic S, et al. Knockdown of filaggrin in a three-dimensional reconstructed human epidermis impairs keratinocyte differentiation. J Invest Dermatol 2014;134:2938-46.